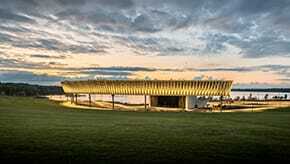 A new amphitheater for Onondaga was designed and built within one year on a Superfund waste site. 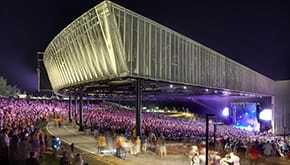 The Onondaga Lakeview Amphitheater is an outdoor event complex, which includes an amphitheater with an estimated seating capacity of approximately 17,500 (both covered and lawn seats), a nature area, vendor/festival area and recreational trails. 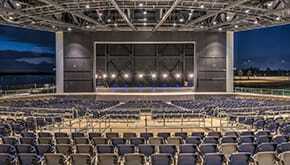 The project included the design and construction of a pavilion, stage-house, back-of-house, loading dock, restroom facilities and a box office from the Design-Build team of Gilbane and Architects Westlake Reed Leskosky (WRL) and QPK Design. The design of the pavilion roof, a key contributor to the architectural shaping of the facility, utilizes eight trusses with four unique end conditions and achieves a maximum span of 190’. Each of the trusses weigh over 84,000 pounds at 190 feet in length, and are supported by the steel at the stage and columns. The trusses are so large that they presented potential safety issues with delivery, so Gilbane arranged deliveries of the intermittent truss sections to be escorted by over 15 New York State Police. The largest challenge to overcome was the condition of the site itself, with the Amphitheater situated on an Environmental Protection Agency (EPA) Superfund waste site. Gilbane re-mediated the area to comply with Federal, State and local environmental regulations. By the end of the project, over 80 thousand cubic yards of existing industrial waste had been excavated and relocated to an onsite staging area, with more than 130 thousand cubic yards of infill material imported, not including topsoil. In addition to providing a new community space, Gilbane achieved over 20% local Minority and Women Based Enterprise (MWBE) participation, including mentoring opportunities for the smaller companies. After almost a year of collaboration from the Design-Build team, the result is a stunning space that provides the county with an area to gather together as a community. 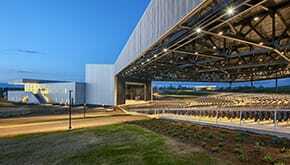 The state-of-the-art performing arts center has transformed a previously dilapidated piece of land into an iconic destination that reflects the beauty of the surrounding land and encourages a celebration of arts and culture.